Just recovering from the flu (why can’t Mother Nature make up her mind and stop swinging between balmy spring breezes and freezing snowstorms please?) and my skin is paying the price. All of a sudden, it’s broken out into super-deep acne cysts, extreme dullness and flaky patches, which are getting far tougher to cure than the fever and cold themselves! My dermatologist tells me that I should have looked after my skin while I was sick in order to stave off the spotty, flushed, dehydrated side effects right at the beginning. 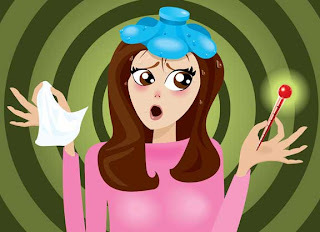 Thankfully, her preventive measures are super-simple, ‘coz much as I love my beauty stuff, doing anything more complicated than blowing my nose was rather impossible between medications, itchy throats and fevers. There is nothing like an infection to make the skin look dull and completely lacklustre. Plus, the congestion is a terrific breeding ground for zit-causing bacteria. So, think mint. Copious amounts of mint, in every form possible. Tea, face pack, face wash, moisturiser… not only will natural mint-infused oils and creams open up a stuffy nose, they also help the skin breathe and detoxify. Aveda has some terrific options that will soothe both body and mind. I know, I know… this can be a pain but remember that decongestants dehydrate the skin, leaving it dry and flaky. Using a humidifier – especially at night – keeps moisture in the air, which maintains hydration levels in the skin and keeps it feeling supple (and comfortable!). Pop a cold gel mask in the fridge – it’s a terrific way of replacing the skin’s moisture and decongesting the face (while alleviating a pounding head for bonus brownie points). Jurlique’s Herbal Recovery Antioxidant Gel Mask makes for a terrific option. Blowing your nose repeatedly? Stay prepared for red, dry and irritated skin around your nostrils, even with moisturised tissues. Unless (and I learnt this too late) you dab on a bit of cream on your nose after every blow. Creams that contain lipid-rich oils and ceramides are the best bet, like Kiehls Ultra Facial Moisturizer.